[AUTO](RC):At the end of the battle it attacked a vanguard, COST [put this unit into your soul], choose one of your opponent’s rear-guards, and retire it. 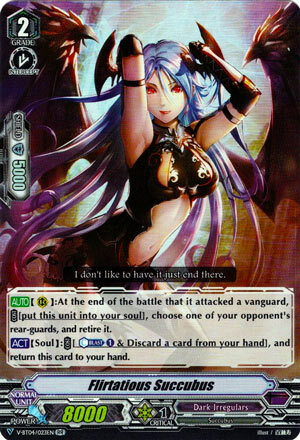 [ACT](Soul):COST [Counter Blast (1) & Discard a card from your hand], and return this card to your hand. Main way to proc Dantarian. The retire skill is primarily what you’ll use her for, and even though she’s a +0 you choose what dies so it’s high quality at least. I wouldn’t use the second skill unless you were screwed for attackers, and in a Protect deck I don’t see why you would be, but it’s nice to have as a little bonus. Useful in her own Dantarian build but watch your resources.